Spend some time in the mom circuit and you've seen and read enough mom praise to last a lifetime. I'm not trying to trivialize any of it because mom life is hard. It's exhausting. Today I told my husband that I actually wanted to eat lunch and the concept of doing so was so surreal that I felt like sobbing tears of joy at the very thought. I'm used to being bossed around and yelled at by a sleep protesting small human being on the regular and sacrifice is just a necessary part of the job which, of course, us moms don't get paid for. But there is joy in the exhaustion and the pitter-patter my heart does when I point out that I have taught him everything he knows. There is the pride in celebrating his first time successfully maneuvering the tongs in Tot School or when he picks out his name typed out in an e-mail or when he jumps off the side of the pool and into the water. There is pride, of course, and a phone call to a daddy who is buried underneath piles of work and has missed out on all of these celebratory occasions and likely many in the future simply because he cannot be there but wants, more than anything, to be. Dads are often overlooked. There isn't enough praise given to dads who are continually shaping their children's lives and helping them turn into strong, proud adults. I fell in love with my husband when he was a lanky teenage boy in an Operation Ivy t-shirt and I fell in love with him tenfold the first time he held our son in his arms. Watching him fall so seamlessly into his role of daddy has been the greatest gift in itself and realizing that this is the man I will be spending my life with, raising these children with, makes me realize regularly how lucky that I am. After Ethan's birth, I suffered from a few post-natal complications and it was all him taking care of Ethan. The middle of the night wake-ups, feeds, diaper changes -- it was all him and throughout the day, it was still all him taking care of me, too. He's always taking care of me. When I'm lost on a drive hours away from where he is at his desk at work, he still patiently coaches me through a new route over the phone. When I can't remember where I put my shoes, I frantically call him at work and he usually knows right where they are. When it's midnight and he's just getting in from a disgustingly long day at work, he takes care of the piles of dishes in the sink so I can take care of the Tot School plans. I love watching my husband as a dad. I love the way he knows it's called spending time with his child and not babysitting when Ethan is in his sole care. I love the way he opts to spend his brief moments off from work with Ethan. I love the way if you presented him with an option to have five consecutive hours of no stress, no work time to spend any way that he wants, he wouldn't hesitate before opting to spend it with Ethan. I love the way he plans his days at work around being home in time to be the one who does the bathtime and bedtime routine as much as it can be possible. And it isn't always possible, which is what hurts. I love the way my husband is a living example of the kind of man that I want Ethan to be: the kind that loves unconditionally, the kind that doesn't place demands or unrealistic expectations. The kind that cherishes Ethan's happiness and well-being above all else in this world. The kind who will ensure Ethan is raised knowing that love, respect, kindness and fairness make up a home. I'm throwing my hands up and taking a stand for all those daddies like Ethan's who don't get enough credit. 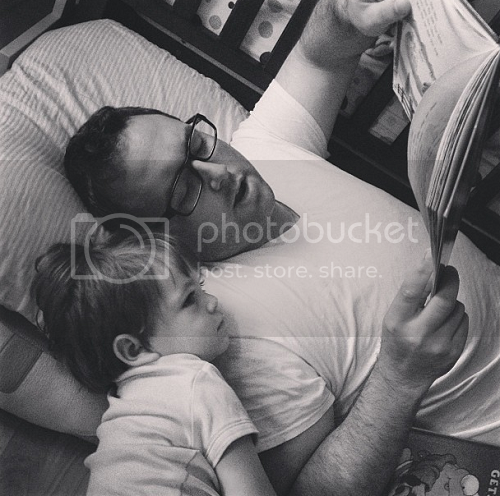 Who are total Super Dads in every sense. Who know how to whip up their kids favorite snacks and devote their lives to being present as much as they can. To those daddies who are forced to be far away due to work, to the ones who spend far too much time in a cubicle or office, to the ones who stay-at-home with the children while their mom works. To those daddies who only get to see their children on weekends, to the ones who are single parents and do the job of both Mom and Dad themselves. To the Super Dads everywhere, I want to recognize you, and salute you, and say that we're appreciative. This one is for you and I am super excited to bring this special giveaway your way! BKYkid's railroad and car play mat t-shirts for dad make me smile. Ethan is totally obsessed with cars, trains (and even toy dinosaurs which, in Ethan's history books, totally share the road with modern day automobiles). 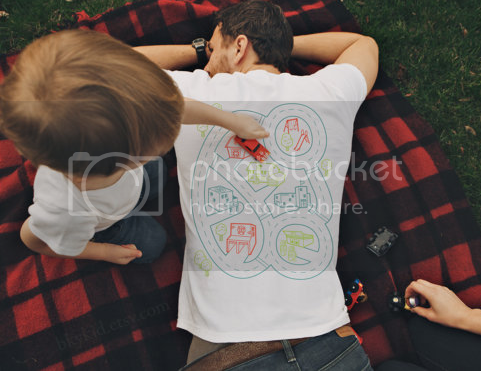 These shirts double as playmats to provide endless fun and bonding time between dad and child -- with a little bit of a back massage thrown in for dad! (I'm also just sayin', if you're smart, one of these will end up under your tree this year!) I'm excited to be able to give one lucky Super Dad one of these fun play mat shirts ($22.00 value). Oberon Socks are dress socks with a kick that totally add some hip factor to the dull corporate uniform. The plus is they're still fun for everyday wear, too! Each pair of these 80% cotton socks add a pop of argyle and a whole lot of hip to ordinary men's socks. Oberon are giving one lucky dad the chance to win a pair of their amazing socks ($14.95 value). Jack Black is a name known in the beauty product world for luxurious men's products. 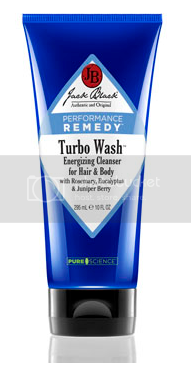 Their Turbo Wash is an energizing cleanser for men that is both a shampoo and body wash. It contains rosemary and eucalyptis that helps naturally support immunity and Juniper Berry that helps detox the body. Jack Black have generously donated a three ounce tube of this amazing, energizing hair and body wash (a $10 value) to one lucky Super Dad! The Chicago Comb Company's combs are absolutely timeless and gorgeous. 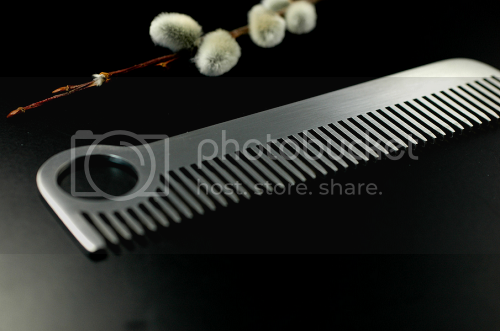 They are manufactured with traditional hand craftmanship and the latest technology to turn a sheet of high quality stainless steel into a beautiful, timeless comb. All Chicago Combs are made in the USA (right down to the shipping boxes) and are the perfect elegant keepsake for a Super Dad. Chicago Combs are available in a variation of finishes including custom engraving! The Chicago Comb Company have graciously offered one Super Dad the opportunity to win one of their gorgeous matte finish combs which comes brushed in a metal, satin finish (a $35 value). 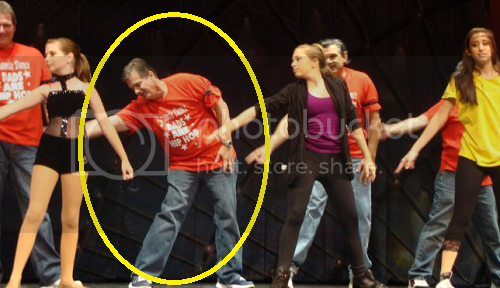 And just because it wouldn't be a post about Super Dads without a mention of my own dad, here's a photo of him dancing a mean hip-hop number at my teenage sister's dance recital a few years ago. It takes one pretty fierce Super Dad to get up on stage and show off those moves. Dads are taking such an active role now and it wasn't that long ago that they weren't really expected to. I think it's nice! I'm all entered in the contest. Thank you for linking to Super Sunday Sync. Ohhh super dads...i just love when I see my husband with our lil girl...she is going to be a daddy's girl for sure!...your dad is awesome on that recital!